It was easy to miss the release of the eight Presidential $1 coin last week given all the buzz with the U.S. Mint’s clearance sale and its announcement to drastically cut coins from its 2009 numismatic portfolio. 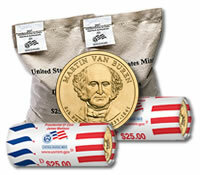 The final 2008 Presidential Dollar honoring Martin Van Buren went into circulation on Wednesday, November 13. "Martin Van Buren rose from humble beginnings to become an influential politician through hard work, an attribute that exemplifies the American spirit," said United States Mint Director Ed Moy. "We, too, can show our American spirit by using Presidential $1 Coins. They are resilient, practical and 100 percent recyclable." The Mint points out in part of the educational initiative with each dollar’s release that Van Buren was the first President born in the United States. His predecessors were of British ancestry or were born British subjects. Martin Van Buren was often called "The Red Fox of Kinderhook" for his red hair, political acumen and birthplace in New York. Although more than a billion Presidential $1 Coins have been minted, it is often difficult to find the coins through banks or in daily transactions. The US Mint offers them online at Presidential $1 Coin Products in 25-coin rolls for $35.95 and in 250-coin bags for $319.95, with either the Philadelphia, “P”, or Denver, “D”, mintmark. The United States Mint will ceremonially introduce the Martin Van Buren Presidential $1 Coin on the anniversary of his birth, December 5, 2008, in Kinderhook, New York. Already launched this year were $1 coins celebrating James Monroe, John Quincy Adams and Andrew Jackson.